You may apply at hotspringspool.com or stop by the Business Office. Job Fair at GHS April 24th, 3:30-7:00 pm Pool Entrance at 401 N River St. Be prepared to interview. Opportunities in all areas. Our therapeutic spring waters—called Yampah, or literally Big Medicine, by Ute Native Americans—have been bubbling up from the earth's core for millions of years. 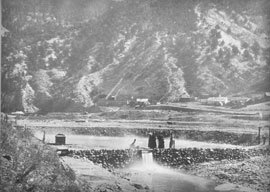 The Utes were the first known visitors to the mineral-rich hot springs that flowed along the banks of the Colorado River in Glenwood Canyon. Captain Richard Sopris heard about these legendary healing waters, and he and his party of geographic explorers found the sacred healing spot in 1860. Twenty years later, Walter Horace, James Devereux, and a group of British investors purchased the Yampah Hot Springs along with ten acres of surrounding land. They set out to harness the 3.5 million gallons of naturally hot mineral water that rises from the source of the spring each day. 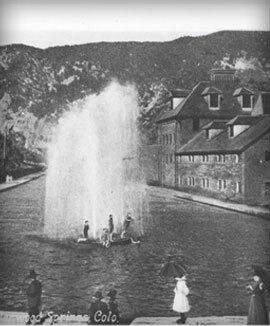 In 1888 the world’s largest hot springs pool was born in the newly established town of Glenwood Springs. It became world-renowned as a healing wonder set in a mountain paradise. Around the turn of the century, the Golden Age of Mineral Spas, it was referred to as “Spa of the Rockies”, when "spa" was defined as hot spring bathing. The original red sandstone bathhouse and lodge was built for $100,000 in l890. Designed by Austrian architect Theodore von Rosenberg, the walls of both the pool and the bathhouse were of solid masonry with peach-blow sandstone quarried nearby. The bathhouse featured tubs, roman vapor baths, special accommodations for pool bathing, a ladies parlor, physician’s office, gymnasium, and smoking and reading rooms. Each of the building’s 44 bathing rooms included a dressing room and lounge. As word of this new resort spread, aristocrats, political leaders, movie stars and spiritual believers ventured to Glenwood Springs from around the world. During World War II, from 1943 to 1946, the resort— then consisting of the Hotel Colorado and Hot Springs Bathhouse—were used exclusively as a U.S. Naval Convalescent Hospital. This was the only time in history when it was closed to the public. After the war and until 1950 it was converted into Glenwood Clinic, a private hospital. Since that time and until today, it has been known as Glenwood Hot Springs. A new master plan was implemented in 1970, including an updated water filtration system, children’s wading pool, water slide, and miniature golf. And in 1986, the new 107-room Glenwood Hot Springs Lodge was built just north of the pool. Today the original sandstone bathhouse is home to the full service Spa of the Rockies—a tribute to the resort’s magical appeal at the turn of the century. Spa of the Rockies delivers natural face and body treatments for health and wellness. Today, Glenwood Hot Springs melds past and present with clean and modern shower facilities and state-of-the-art ozone pool purification system. The goal remains to maximize enjoyment for our guests who continue to visit and relax in our perpetual, revitalizing hot spring waters, now and for years to come.